The Sinumerik 840D sl CNC system platform, introduced recently by Siemens, Chicago, IL, is a universal control covering wide-ranging metalworking operations including laser cutting, punching, milling and grinding. 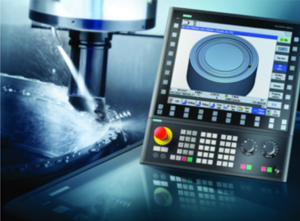 The control also can be used in multitasking machines such as turn-mill or mill-turn centers. This integrated functionality is simple to configure for different machine kinematics, and permits production using widely varied technologies without the need for labor-intensive workpiece reclamping. The Sinumerik Operate user interface provides an integrated turning functionality for milling, and an integrated milling functionality for turning. And, the new OP 019 operator panel has been extended to include a new power-control unit that allows high-speed key actuation at the 19-in. glass front. The operator panel can provide a basic machine display with three or four channels showing as many as 13 axes. The machine’s tool-management system ensures simple handling of all tools, as well as hybrid multi-tools in a single standardized user interface.